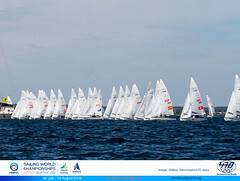 The wind picked up on day three of the Sailing World Cup Qingdao as marks were missed and misjudgements made in the unforgiving waters of the Beijing 2008 Olympic Games. Cloud cover and current played havoc with on water decisions in China as sailors continued learning the tricky elements Qingdao has to offer. 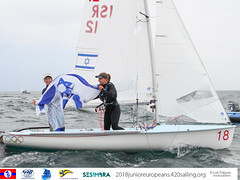 It wasn't just about the visiting sailors either as fleet leaders and home nation competitors were not exempt from mistakes cutting point gaps at the top. When Hao Lan and Chao Wang (CHN) started the day their lowest score was a second place and they were beginning to look comfortable at the top of the leaderboard, but one bad day and that has all changed. 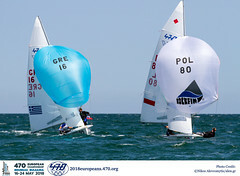 The bad sailing day for the Chinese pair was a ninth and discarded tenth, but due to their strong first two racing days they still sit top on 15 points. Lan and Wang's lead has been cut to just two points with Liangdao Weng and Youjian Wen (CHN) scoring a second and a discarded 11th to sit on 17 points. Completing the podium are Zangjun Xu and Wei Wang (CHN) who did have a good day and took a bullet and fourth place. They have 24 points total. The second bullet in the Men's 470 went to Yong Chen and Chuantian Wen (CHN) who had a totally mixed day as they were disqualified from the first race. They currently sit in eighth on the leaderboard. Mengxi Wei and Yani Xu (CHN) returned to winning ways with another perfect day. Two bullets from two races gives them top spot with five points and a nine-point gap back to Shasha Chen and Haiyan Gao (CHN) who are in second with 14 points. Chen and Gao could only manage a 2,5 day and will need to do more to keep the pressure on their compatriots. Sitting equal on 17 points are Shengnan Ni and Lizhu Huang (CHN) in third and Nan Zhang and Xiao Lu (CHN) in fourth.